Alpha fetoprotein (AFP) is a protein produced by the liver and yolk sac of a developing baby during pregnancy. AFP levels go down soon after birth. It is likely that AFP has no normal function in adults. A test can be done to measure the amount of AFP in your blood. A blood sample is needed. 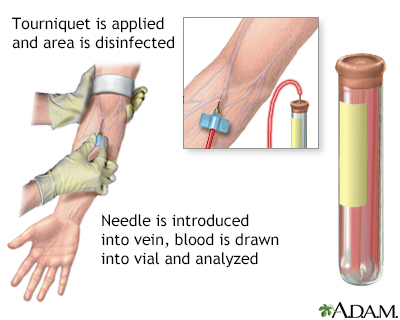 Most of the time, blood is typically drawn from a vein located on the inside of the elbow or the back of the hand. You do not need to take any special steps to prepare. Screen for and monitor some cancers. The normal values in males or nonpregnant females is generally less than 40 micrograms/liter. Driscoll DA, Simpson JL, Holzgreve W, Otano L. Genetic screening and prenatal genetic disgnosis. In: Gabbe SG, Niebyl JR, Simpson JL, et al, eds. Obstetrics: Normal and Problem Pregnancies. 7th ed. Philadelphia, PA: Elsevier; 2017:chap 10. Fundora J. Neonatology. In: Hughes HK, Kahl LK, eds. The Johns Hopkins Hospital: The Harriet Lane Handbook. 21st ed. Philadelphia, PA: Elsevier; 2018:chap 18.